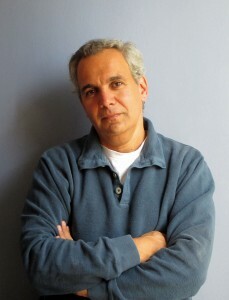 Emil Sher has written for young audiences and the once-were-young. His stage works include Derailed, Bluenose, Beneath the Banyan Tree, Mourning Dove and his acclaimed adaptation of Hana’s Suitcase. Current projects include a commissioned adaptation of Ian Brown’s The Boy in the Moon and Omega, a new work in development with Roseneath Theatre. Emil has written the narrative for a children’s ballet and created Breadbox Theatre to introduce school-age children to live drama. To learn more, please visit emilsher.com. 1. What inspires you as a playwright? Where does your motivation come from? Simply stated, I am most inspired by playwrights and the plays they have given us. I have vivid memories of moments that unfolded on stage that affected me in ways that cannot be described and can only be experienced. It is that singular experience that motivates me, in that I hope my words — married to the work of an actor, a director, a designer—can hold others as I have been held, even fleetingly. 2. What inspires you to write for young audiences? There’s a range of age when we refer to young audiences. Some are in kindergarten. Others might be as old as seventeen and on the brink of adulthood. In all cases, I believe younger audiences bring a sensibility to playwatching that has not yet been shaped by the worldly experience that awaits or that is just around the corner. It’s not that younger audiences are more innocent than older ones. Hardly. In many ways, they’re more sophisticated. What is inspiring is that the door is still open to change, to possibilities. As we age, our convictions, our beliefs often harden and ossify. With younger audiences, the clay is still wet. 3. What is your writing process? Is it basically the same for each play or does the script affect your process? 4. What are your most productive writing habits? The smell of freshly-baked cookies is a good as any to put the brakes on creativity. The biggest distraction, of course, is the Internet. I find myself most productive in environments where there is no wi-fi access. There is software that can block access to the Internet on one’s own terms but whatever can be locked can be unlocked. And so I begin each day with a silent prayer to the Gods of Self-Discipline. 6. When revising a draft, what are your stumbling blocks and how do you push past them to the next draft? It’s not so much the stumbling blocks I encounter in the course of rewrites as it is the sensation that every day devoted to the next draft feels like a small step up a steep mountain. Reach the mountain and you get a glimpse of the promised land of a production. Well, it isn’t promised, but it makes for a fulfilling journey. 7. What is the best advice someone gave you about your work? I can’t recall a specific kernel of advice—it’s more my reading of one playwright’s response to criticism of one of his works. A.R. Gurney digested the bad reviews and essentially headed to bed in a fit of despair. The next morning, he got up and continued to write. What I’ve taken from that moment is two-fold: acknowledge and affirm whatever feelings you may have in light of the slings and arrows you may have to dodge, but don’t linger in the shadows. Most importantly, persevere. I don’t let good reviews affect me any more than bad ones. Stay even-keeled. Stay the course. 8. What role does the dramaturg play in your process? We understand that two heads are better than one, so it stands to reason that an extra set of eyes on one’s script can only be a good thing (some exceptions apply, of course; the broth of a play can be spoiled by too many cooks, or at least a cook with the wrong ingredients). The right dramaturg has but one agenda: to recognize what I am trying to achieve with a script and to help me achieve it. That’s done by asking the right questions, and a good dramaturg will ask challenging questions that lead me to justify all my creative choices. 9. What do you wish you had known about playwriting or the theatre ecology when you started? It’s not so much what I didn’t know about playwriting, but rather getting confirmation that playwriting, like all crafts, is a lifelong apprenticeship where we are constantly learning, including the Sisyphean struggles of getting a script to sing. Looking back, what I see is the starting point of a journey where experience is invaluable, but is just one ingredient in our daily bread. 10. What is your most effective marketing tool? Ultimately, what ‘sells’ a play is the play itself, by which I mean if a story is worth telling (and retelling, in subsequent productions) then others in the community—audiences and artists and all those in between—will recognize its intrinsic worth. So whereas word-of-mouth is one of the most effective marketing tools, it helps to step back and ask oneself: what has to happen in order for those words to find themselves in mouths? When a work resonates, when it strikes a chord within us, we have an almost primal need to share the story, to speak of its impact. True, savvy marketing can bring audiences to mediocre plays. The challenge—and reward—is not simply to reach a ‘market’ but to leave a mark once a production has moved on and audiences are left behind to ponder it. 11. How important for playwrights is networking/knowing your community? One synonym for networking is ‘schmoozing’, and that word should come with a napkin to gently wipe away the oily residue it sometimes leaves in its wake. Some believe that to network/schmooze is to sully our calling as playwrights. I think it’s essential, and ultimately speaks to a sense of mutual support and goodwill that nurtures our collective wellbeing. So there’s no need to be self-conscious about seeking a guiding, helpful hand. Equally, those of us farther down the road owe it to ourselves and each other to occasionally look back to see who’s behind us who could use a boost, or who is beside us who might embrace work we decline. A concrete example: years ago Black Theatre Workshop approached me to gauge my interest in writing a TYA play about multiculturalism. The company had knocked on my door thanks to Dave Carley, who was too busy to take it on, and set the ball rolling in my direction, a ball I picked up and ran with. BTW joined forces with Geordie Productions to commission Bluenose, a play that premiered in Montreal in 2003 and has since toured Nova Scotia, Southern Ontario and Saskatchewan, with mainstage productions in Seattle and California. 12. What upcoming projects are you working on? Current projects include a co-commissioned adaptation of Ian Brown’s The Boy in the Moon for GCTC and the Belfry. Omega is a play about a teen who uses graffiti as a form of self-expression, and I will be developing that at Roseneath Theatre during a playwright residency, thanks to the Ontario Arts Council. I am also revisiting, with a very supportive hand (paw?) from Pat the Dog, a piece of verbatim theatre—Conviction—about the devastating impact on individuals accused of killing children in their care, owing to the testimony of disgraced pathologist Charles Smith.